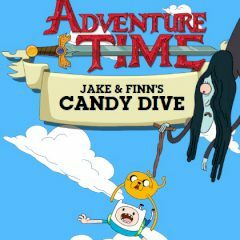 Finn and Jake want to break the charm of the evil witch. Save all Candy People while you fall down and collect candies to increase the amount of points. Reach the finish having all people. Finn and Jake never miss an opportunity to help people. They like adventures and they always find them wherever they are. Now they have faced a terrible act of the witch crafting made by the evil witch. She wanted to bring madness to the villagers and she made it. Bring back the old order of things and save people from this candy madness.